Draft: 1992, Seattle Mariners, 36th rd. Raul (rah-OOL) Javier Ibañez (ee-BAHN-yez)...resides in Miami, FL & Sammamish, WA...married to Teryvette with two sons, Raul Jr. and Luca Gabriel, and three daughters, Sophia Isabella, Victoria Alessandra and Carolina Danielle...graduated from Miami (Fla.) Sunset High School in 1991...attended Miami-Dade Community College and was an all-conference selection in baseball...converted from an outfielder in high school to a catcher in the pros... selected as Seattle's nominee for the Roberto Clemente Award for three consecutive seasons from 2006-08...presented with the 2011 Tug McGraw Good Guy Award by the Philadelphia chapter of the BBWAA...created Ibañez Team Resurgence in 2009 for homeless and at-risk youth in the Philadelphia area, which provided t-shirts and game tickets... regularly met with groups of teens from the Covenant House Pennsylvania and Project H.O.M.E. Hit .242 (110/454) with 29 home runs and 65 RBI during his 18th big league season and his 11th with the Mariners...29 home runs were T11th in the AL...Marked eighth time in career eclipsing the 20 home run plateau... Hit 29th and final home run on September 23 at Angel Stadium...His 29 home runs tied Ted Williams (1960) for the most hit by a player 41 or older... Hit .267 (74/277) with 24 home runs before the All-Star break compared to .203 (36/177) with five home runs in 51 games after the All-Star break... Played in 124 games for Seattle (97 in LF, 21 as DH, 1 in RF, 5 as a PH)...Has appeared in at least 120 games in each of the last 12 seasons and has recorded at least 100 hits in 11 of those campaigns. Had his streak of 10 consecutiveseasons with 30 doubles snapped...had the longest active streak of 30+double seasons from 2002-11 ... Appeared in 130 games with theYankees, making 99 starts (LF-65, DH-23, RF-11) ... Of his 19 home runs, 7 game theYankees a lead and 11 came in the 6thinning or later ... Hit .320 (8x25) with 2 doubles and 2home runs as a pinch-hitter ... Hit first career Opening Day home runApril 6 at Tampa Bay...4 RBI on OD was tied for most in a Yankees debut with RogerMaris (5/19/60)...14th career Opening Day roster and 11th start ... Hit 10th career grand slam July 16 vs. Toronto ... Batted .405 (15x37) with 9 RBI over 11 games from Sept. 22-end of the season ... Recorded his 16th career multi-homer game Sept. 22 vs. Oakland; go-ahead pinch-hitsolo HR in the fifth and a game-tying two-run homer in the 13th ... Hit game-tying, pinch-hit, 2-out, 2-run HR in the ninth inning and a walk-off single in the12th inning Oct. 2 vs. Boston...became the first player in franchise history to hit a game-tyinghome run in the ninth and then have a walk-off RBI later in the same game. In his final season in Philadelphia, hit .245 (131-for-535)with 65R, 31 doubles, 20HR and 84RBI in 144 games(131 starts in LF)... Hit the second-most home runs in Phillies historyamong players that turned 39 years old in a season,trailing only Cy Williams, who had 30 in 1927... Went hitless in 35 straight at-bats from 4/18-5/3, thelongest such streak of his career and longest by a Philliesince 1998 (Desi Relaford, 0-for-36)... Collected his 1,000th career RBI in 6/5 win at Pittsburghon a sacrifice fly... Hit his sixth career walk-off home run in 7/8 win vs. Atlanta... scored his 900th runon the HR...named NL "Player of the Week" for the period ending on 7/10... Missed three games from 8/22-24 with a left groin strain... Hit his 250th career HR in 9/7 win vs. Atlanta... connected for his ninth career grandslam in the Phillies' division-clinching win on 9/17 vs. St. Louis... Collected his second career pinch-hit homer in 9/20 Game 1 loss vs. Washington,tying the game in the seventh inning with the three-run HR... Went 3-for-15 with 1R, 1HR and 4RBI in the Phillies' NLDS loss vs. St. Louis. Named the Mariners' MVP by the Seattle chapter ofthe BBWAA; second time in his career to win the award(2006)...Started all 162 games for the 2nd time in his career,tying the club record for games played in a season...Made 153 starts in LF and 9 at DH...Finished 5th in the AL in RBI (110), T-6th in hits (186),7th in IBB (11), T-7th in doubles (43), 9th in total bases(304) and T-10th in XBH (69) and OF assists (9)...Had his 3rd consecutive 100-RBI season and 5th overall...Batted .327 (56-171) with RISP, 10th-best in the AL...Hit .305 (60-197) vs LHP...Tied a club record with 11 RBI over 2 games, 8/4-5vs MIN...Clubbed 2 grand slams: 7/18 vs CLE (A. Laffey) and 8/4vs MIN (G. Perkins)...Reached base safely in a career-best 33 consecutivegames, 8/9-9/15 (.389, 11 2B, 2 3B, 5 HR, 27 RBI)...Hit his 4th career walk-off HR, 8/7 vs TB...Had his 9th career multi-HR game, 4/11 vs LAA...Named AL Co-Player of the Week, 4/7-13 (.370, 3 2B, 3B,4 HR, 11 RBI). Made 131 starts in LF and 13 at DH...Led the team in RBI (105) and ranked 2nd in XBH (61)...Had 3 multi-HR games: 6/11 at CLE, 8/7 at BAL and8/20 at MIN...From 8/1 through the end of the season, ranked 4th inavg (.357) and hits (76), T-5th in HR (15) and T-8th inRBI (44)...Tied his career high with 5 consecutive multi-hit games,8/7-11 (.565, 12-23); also hit 5 HR in that 5-day stretch...Named AL Player of the Week, 8/6-12 (.481, 5 HR, 11 RBI)...Ranked 3rd in the AL with 47 two-out RBI...Hit two grand slams: 6/23 vs CIN and 9/18 at OAK...Batted .526 (10-19) with the bases loaded, 8th-best inthe AL...Missed 6 games with a hamstring injury (6/24-30) and5 games with a sore lower back (5/19-24). Ibanez reached career bests in hits (181), home runs (33), RBIs (123) and at-bats (626) with Seattle in 2006. Ibanez was twice named the American League Player of the Week. He hit home runs in three consecutive games (Sept. 24-26). Drove in over 100 runs for the second time in his career with Seattle (the other coming in 2002 when he drove in 103 runs). One of six AL players to appear in all 162 games, and one of two Mariners (also: Ichiro)...Played first base (4 games), designated hitter (101 games), left field (55 games) and right field (3 games)...Had 45 multi-hit games...Hit in a season-high 11 straight games May 29-June 10...Batted .320 (33x103) in June...Drove in 21 runs in July in 28 games...Hit 100th career home run on Aug. 4 at Detroit (off Sean Douglass)...Had four hits twice in 3-game series vs. LAA from Sept. 12-14... Sept. 14 marked the seventh game in his career with four or more hits; also collected season-high 4 RBI and HR #19...Homered in the final game of the season to reach 20 homers for second time in career (also: 2002). Posted a career-high .304 average in first season back in Seattle...finished tied for 11th in the AL with 24 go-ahead RBI...homered in three straight games, April 18-20, hitting four home runs...hit two home runs, his 4th-career two-homer game, including a walk-off home run in the 9th inning, his third-career game-ending home run, in a 2- 1 win April 20 vs. Oakland...left game on June 2 with strained right hamstring; on the disabled list June 3-July 9...had five hits Aug. 17 at Kansas City, going 5x5 with a double and 4 runs scored...batted .340 (33x97) in 24 games in August raising his average 21 points in the month...set a career high and a club record and matched the AL record with six hits Sept. 22 at Anaheim, going 6x6 with 5 RBI...joined Ichiro Suzuki as only Mariners ever with two 5-hit games in one season...reached safely in 11 straight plate appearances Sept. 22-24, matching the club record, including 9 straight hits, a new club record...batted .333 (93x279) after the All-Star break, tied for second in the AL (w/Melvin Mora) and trailing only teammate Ichiro Suzuki...batted .377 (75x199) in Mariners wins, compared to .252 (71x282) in Mariners losses. Hit .294 for 2nd straight season with 95 runs scored, 90 RBI and a team-leading 33 doubles...finished sixth in the AL with a .319 average against right-handed pitchers...9th in the league with 56 multi-hit games...career-high 10 sacrifice flies, tied for 3rd in the AL...went 2x3 with 2 solo home runs at Seattle on May 20; was his 2nd career multi-homer game (also at Seattle, July 2, 2002)...collected 2 hits in the 6th inning June 17 vs. Minnesota...had 3 RBI vs. Cleveland on July 2 without getting a hit (0x3, walk, sacrifice fly)....had a season-high 5 RBI vs. Tampa Bay on Aug. 1, hitting a 3-run home run with a bases loaded walk and a sacrifice fly...career-best 13-game hitting streak from Sept. 13-25. Recorded his 1st career 100-RBI season after driving in just 112 total runs in his 1st 4 ML seasons...hit a walk-off home run off Mike Timlin vs. St. Louis on June 9 for a 3-2 win...doubled, tripled and homered in his first 3 at bats vs. June 25 vs. Detroit; was intentionally walked in his final plate appearance... was hit by a pitch with the bases loaded in the 10th inning to drive in the winning run of a 13-12 win vs. Cleveland July 21; also hit a game-tying 2-run HR in the 9th off Bob Wickman to send the game into extra innings...named AL Co-Player of the Week with Carlos Beltran for July 15-21 after leading the Majors with 16 RBI and hitting .333 (12x26)...had a ML-best 31 RBI in July...hit .322 in August (38x118) with 9 doubles, 7 HRs and 28 RBI...had 7 RBI July 14 vs. Anaheim after hitting a grand slam (2nd career) and a 3-run home run in the 1st 2 innings...finished 3rd in the Majors with a .410 (25x61) batting average during Interleague play and was tied for 3rd with 18 RBI and finished 7th in hits...hit a total of 3 home runs in extra innings. Made Kansas City's Opening Day roster after being a non-roster invitee to spring camp...was designated for assignment on May 4 and June 8 and cleared waivers both times...emerged as a regular starter on June 19, making 65 starts and hitting .298 (70x235) the remainder of the season...started 33 games as DH, batting .288 (34x188) with 3 home runs and 22 RBI...hit .361 during June, going 13x36 with 3 home runs and 12 RBI in 16 games...played centerfield on May 3 vs. Cleveland, just the 2nd time in his career he played the position (also Sept. 11, 1998 at KC)...hit 5 home runs in a 9-game stretch June 29-July 7...hit 5 homers in a 10-game stretch from Aug. 9-20, going 12x34 (.353)...homered in a career-best 3 straight games at Cleveland on June 29, 30 and July 2...teamed with Mike Sweeney and Carlos Beltran to become just the 2nd trio in Major League history to homer in the same 3 consecutive games; the only other teammates to accomplish the same feat were Dante Bichette, Vinny Castilla and Larry Walker with Colorado from Aug. 2-4, 1995...made his pro debut at 3rd base July 8 vs. Houston...hit pinch-hit homer Aug. 18 at Detroit, a 3-run shot off C.J. Nitkowski. Was used primarily as a pinch-hitter and a reserve for Seattle's veteran outfielders... placed on the 15-day DL Aug. 8 with a strained groin; reinstated on Aug. 22...pinch-hit single on Sept. 11 vs. KC snapped a personal 0x23 stretch as a pinch-hitter, dating back to May 12,1999. First full Major League season...used primarily as a pinch hitter and defensive replacement at the beginning of the season...played four different positions, including: catcher (1 game), first base (21 games, 18 starts), left field (22 games, 7 starts) and right field (39 games, 22 starts)...made his first ML appearance at catcher April 13 vs. Texas...on DL May 18-June 4 w/pinched nerve in neck (rehab at triple-A Tacoma May 26 to June 3)...knocked in game-winning run in 12th inning June 29 at Oakland...hit first-career ML grand slam July 17 off San Diego's Reyes; was first grand slam hit at Safeco Field...batted lead-off July 25 for first time in the ML...played 1B, LF, 1B, RF Sept. 6...was 3x4 with game-ending home run Sept. 26 in final home game of season off Anaheim's Shigetoshi Hasegawa...hit home run in first at bat the following day at Texas off Rick Helling. Began season on 60-day DL recovering from surgery on a frayed labrum in the right shoulder, an injury that took place during winter ball...reinstated from the 60-day DL and optioned to triple-A Tacoma on June 28...placed on the DL with a bruised right heel on July 7 and reinstated on July 14...made just one error in 42 games (77 chances) in the outfield with Tacoma...recalled to Seattle Aug. 7; first at-bat was a pinch-hit, bases-loaded, go-ahead two-RBI double that night at Detroit...played with Santurce over the winter. Began season at Tacoma...had season-high 15-game hitting streak July 29-Aug. 27 sandwiched around stop in Majors...hit for the cycle on Aug. 19 vs. Albuquerque (5x5, 2 HR, 7 RBI), the first Tacoma player to hit for the cycle since Marcos Armas did it July 30, 1993...was recalled by Seattle on Aug. 6...collected first ML hit, a triple, and RBI off Doug Drabek in Comiskey Park Aug. 16 (#1)...optioned back to Tacoma on Aug. 16...recalled again by Seattle on Aug. 31...crushed first ML home run, a three-run shot into the Kingdome's third deck in right field Sept. 26 vs. Oakland; was green lit on 3-0 count and tagged upper deck shot off Mike Oquist to pull Seattle within a run (5-4) on Fan Appreciation Night...hit .360 in Santurce. Played at three levels in the Mariners organization, including making his ML debut with Seattle...began the season at Tacoma but was 3-for-his-first-19 and was optioned to double-A Port City April 13...hit .368 with the Roosters...was promoted back to Tacoma May 3...was recalled by Seattle July 31...made his ML debut Aug. 1 at Milwaukee... flied out as a pinch hitter in the 9th inning of Seattle's 9-2 win...made only start (as the DH) Aug. 7 vs. Cleveland...optioned back to Tacoma Aug. 8...played 109 games in the outfield after spending the previous season as a catcher. Began season on DL with a fractured left wrist but ended season as Mariners Minor League Player of the Year...drove in 108 runs in just 95 games...activated May 12 and assigned to class-A Riverside in the California League...spent the season with the Pilots and hit .332 (2nd in the Cal League, 5th in all the minors), with 108 RBI (2nd/4th); average led all minor league catchers...slugging percentage was .612 (2nd in Cal League/3rd in minors)...also ranked among Cal League leaders in: triples (9/2nd), total bases (221/T5th) and extra base hits (52/5th)...named Cal League Player of the Week July 16-22...named to Cal League All-Star team...named by Baseball America as single-A All-Star catcher. Spent season with Appleton...batting average of .312 would have ranked sixth in Midwest League, but he finished 15 plate appearances shy of qualifying...was selected to participate in Midwest League All-Star Game, but was on DL June 4-July 16 with a bruised right shoulder...attended 1994 Arizona Instructional League; batted .303 and led club with three home runs and 17 RBI. Began season at Appleton, but was sent to Bellingham on June 16. Started pro career at Tempe. October 30, 2014 LF Raul Ibanez elected free agency. October 30, 2014 Raul Ibanez roster status changed by Kansas City Royals. October 30, 2014 Kansas City Royals activated LF Raul Ibanez. October 2, 2014 Kansas City Royals reassigned LF Raul Ibanez to the minor leagues. 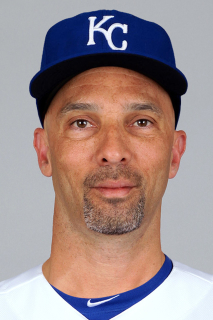 June 30, 2014 Kansas City Royals signed free agent LF Raul Ibanez. June 21, 2014 Los Angeles Angels released LF Raul Ibanez. December 27, 2013 Los Angeles Angels signed free agent LF Raul Ibanez. December 26, 2012 Seattle Mariners signed free agent LF Raul Ibanez. November 3, 2012 LF Raul Ibanez elected free agency. February 21, 2012 New York Yankees signed free agent LF Raul Ibanez. October 30, 2011 LF Raul Ibanez elected free agency. July 10, 2009 Philadelphia Phillies activated LF Raul Ibanez from the 15-day disabled list. July 7, 2009 Reading Phillies sent LF Raul Ibanez on a rehab assignment to Lehigh Valley IronPigs. July 6, 2009 Philadelphia Phillies sent LF Raul Ibanez on a rehab assignment to Reading Phillies. June 18, 2009 Philadelphia Phillies placed LF Raul Ibanez on the 15-day disabled list. Groin injury.